Plum, the French tech binding specialist, makes it a habit of putting weights in the names of their race bindings. The Race 135, as you can probably guess, weighs roughly 135 grams (4.8 ounces), making it the lightest of the company's offerings. Lightweight does not mean weak, however, as Plum has developed a reputation in Europe for making durable bindings that are machined with amazing precision. Constructed with Fortal® aluminum, Ertacetal® high strength plastic, and in the case of the Race 135, a titanium rear fork, these race bindings are engineered to withstand the abuse of everyday touring. 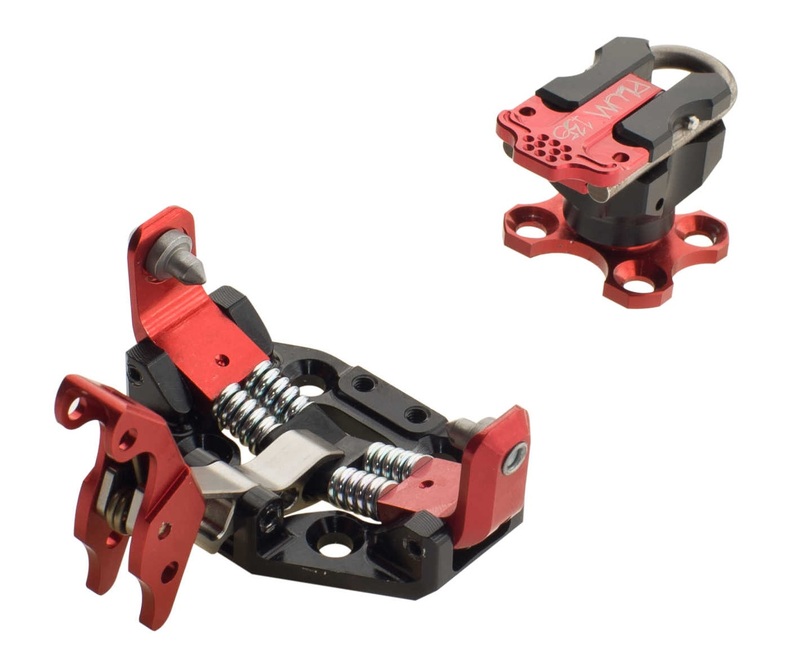 Easy-to-use wedge above the heel pins switches between uphill and downhill modes while also acting as a riser. Bindings release laterally and vertically, with a lower vertical release value than the 145. Optional crampon receptors let you attach most ski crampons for extra traction on ice (5 grams / 0.2 ounces). Plum recommends these bindings for experienced skiers that weigh less than 75 kilograms (165 pounds). For skiers over that threshold, they recommend the Race 145 binding which has a steel rear fork instead of the lighter titanium one found on the 135. Note that titanium forks typically experience more wear than steel but can be replaced as necessary. Notes Recommended for skiers under 154 pounds. Bottom Line Exquisitely crafted lightweight binding. Five Stars for the lightest option – by just a little bit – among Plum’s three different race bindings. This brief review focuses only on what distinguishes the 135 from the 145, so see my review of that “baseline” model for more details on the common features. The only difference in the 135 from the 145 is the substitution of a titanium U-shaped spring for the steel version in the 145. The weight savings per foot are accurately portrayed in the model names. The titanium version is stronger than the steel version, so it might appeal to skiers who worry about breaking heel pins in “Tech”-style bindings. However, it also has a slightly lower effective release value, which would probably not appeal to the type of skier who worries about breaking heel pins. Titanium is also softer, so somewhere after around 100,000’ vertical you’ll start to notice some notching. Depending on your weight, probably somewhere between around 200,000’ and 300,000’ vertical the notching might lead to a noticeably “rattly” feel while skiing, and eventually the notches will cause the pins to become hook-like so as to interfere with lateral release. Fortunately you don’t have to worry about breakage, since the greater strength of titanium (as opposed to steel) will compensate for the notched metal until you retire the pins for either the rattling or the compromised release. And replacing the U spring entails only about a minute or so of work: punch out the retainer pin, slide out the old spring, slide in a new spring, and reinsert the retainer pin. 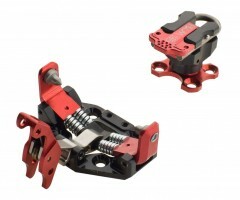 Do the separate ski crampon attachments fit B&D ski crampons? In summary, yes, they should fit. In more detail, although all Dynafit, Plum, ATK/Sportiva/Hagan, and Trab bindings are supposed to be compatible with all Dynafit, ATK/Sportiva/Hagan, and B&D ski crampons, sometimes a little bit of filing/grinding is necessary.